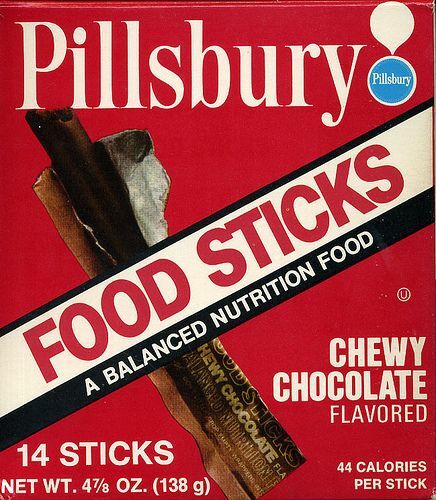 In honor of the anniversary of the first moon walk (June 20, 1969), let's look at Space Food Sticks today. Dr. Howard Bauman created Space Food Sticks for Pillsbury. Before working for Pillsbury, Dr. Bauman created the first solid food consumed by an astronaut (small food cubes for Scott Carpenter, Aurora 7, 1962). 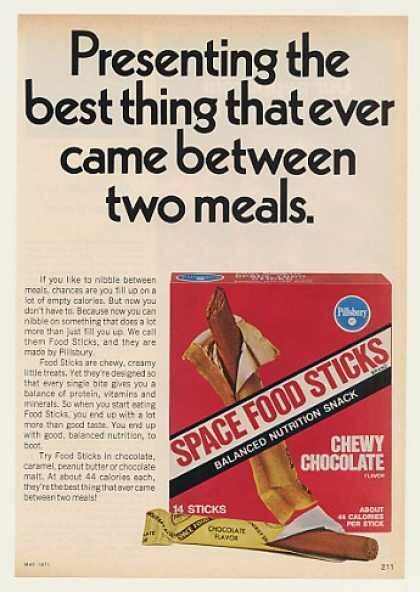 Space Food Sticks were first sold in 1970. They were marketed for children, and I will admit that they often made their way into my lunchbox. 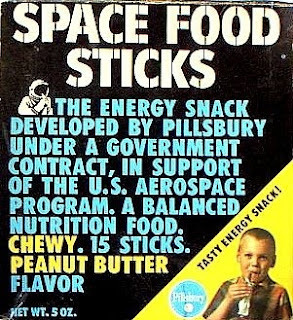 Space Food Sticks came in several flavors. They were chewy but soft. I loved the peanut butter variety! Astronauts on Skylab 3 (1972) ate these sticks in space. Unfortunately, they disappeared from grocery shelves in the 1980's. They have been revived in recent years by Nestle in Australia, but went back out of production in 2014. This is an early package design, as I remember this product from the early 1970's. This box (late 1970's to 1980's from the graphics) is for Chewy Chocolate Space Food Sticks. And ... a fun commercial from the 1970's! 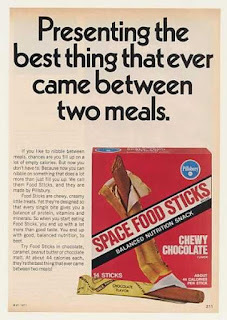 Do you remember Space Food Sticks? What was your favorite flavor? I'd love to hear from you in the comments, below. I love looking back at nostalgic foods that are no longer available! I wasn't around for these spice sticks, but I have plenty of other foods from my childhood that are no longer available. It's fun to reminisce because you can practically TASTE those treats. I don't remember food sticks but I do remember watching the moonwalk on television during school! Watching TV was more exciting than the actual event! I wasn't around for these either. I loved pop rocks and can get them from speciality stores now. I don't remember these! I wish I did because they look pretty interesting. Maybe they'll bring them back again someday. This is so cool, I wish I could try one. Do you think you can find the ingredients list, I'm wondering what that would contain. I loved these as a kid. Peanut butter was my favorite flavor as well. Thanks for the visits and comments. Rebecka, I was not able to find an official ingredients list ... the peanut butter had the most "genuine" taste, and basically tasted like firmer peanut butter.